Introduction to the ACT Essay. This is the quick start guide. And you might actually think of the lession as almost like a navigation, both to the essay section of ACT, and also to just getting yourself set up for practice. I know it's hard sometimes to squeeze in the practice for the essay, it doesn't really always lend itself to easy short verse of review. And I also know that some of you don't really have time maybe to watch all of these lessons. I know that some of these lessons are particularly long, so here's what I'm going to do in this lesson. I'll talk about the essay format at a really general level. Then we'll look at our list of Magoosh essay topics and I'll point out the most essential lessons for you to watch before you dive into practicing. I don't want you to put off the practice too long. And last, I'll give you two sets of instructions. How to prep in four hours and how to prep in two hours. The four hour plan, I think, is actually pretty comprehensive. The two hours, you're kinda skimming the surface a bit. But at least you will get the most important information and the most important type of practice all in a total of two hours, not counting this lesson. The essay is an optional section of the ACT test. And actually right now, most schools do not require it. Fewer than 50% do, but a really pretty big chunk of schools do require it. If you're still on the fence about whether or not to take the essay, go ahead and watch the lesson. Should I take the essay? That's located in the tips and strategy section. And I put that lesson in that section instead of here, because I want it next to the lesson on how to register for the ACT, since that's when most students are confronted with that particular decision. And just so you know, that lesson doesn't say a lot about the essay itself, but it will help you think through your decision as you're registering. If you do wind up taking the essay, you're going to just be writing one, and you have 40 minutes to write it. And that 40 minutes is from the time you first set eyes on the prompt until you have to put down your pencil. And it will be a pencil, you can't write in pen. And you can't write in a mechanical pencil, either. So make sure you have a pencil sharpener. That's good advice for everybody, but especially people who are gonna be writing the essay. On the day of the exam, you're gonna be answering the English, then the math. Then you get a break, then reading and science, another break, and then you write the essay. And actually this break right here is five minutes. It's short. This other one here is ten minutes And you might be feeling kind of frazzled, especially because you will have just come out of the science section, which is such a time crunch. The good news is that the essay, I think, is the least time-crunchy section of the five. 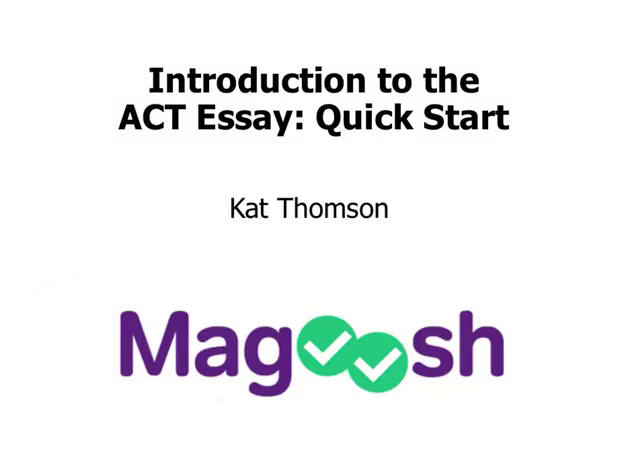 A lot of the ACT really is about time management and test taking skills, but the essay itself is not really meant to be something where you feel like you're sprinting. These are the most important specs to be familiar with and we have a lot more detail in our other lessons. The essay is scored on a 2-12 point scale. So that's pretty different from the 1-36 point scale. And an average score right now is between a six and a seven. The majority of students are going to get either a six, a seven, or an eight. Scores of 12 are very rare and a score of 11 is considered outstanding. So it's a clustered section, a lot of the scores are just clustered in the middle. And your essay score does not affect your composite score, so technically you could get a two on the essay and still get a 36 on the ACT. The style is argumentative, which is actually the style that I think most students are best trained in. So, as opposed to analytical or interpretive, you're basically going to be defending your position in relation to given stances on a social issue. You'll be given the social issue. You'll be given three stances and then you get to construct your own argument from what you're given. And the approximate length, there isn't a minimum or a maximum. But I usually recommend 300 words, at least as a good starting target. And if you can do that and do it well during your practice sessions, you might try and get something closer to 500. 300 words is usually about a little under two pages. For somebody with average size handwriting. Another way to think about the length is you're looking at about three long body paragraphs with super short interests, super short introduction to the ACT essay. This is the Quick Start guide, and you might actually think of this lesson as almost like, and this is what you're gonna see when you get to that section of the exam. You'll have your first page, which introduces the topic and has instructions. Then you have two pages of scratch paper, and this verbage up here is just kind of telling you that it's scratch paper. It's not gonna count towards your grade at all. And then you have four pages of lined paper. And that's what the actual graders look at. They don't look at your notes or outlines or any of that. In the very next lesson in this series, I'm going to go through the sample prompt in quite a bit of detail. But for this initial lesson, the only thing I'm going to focus on right now is the essay task here at the bottom and that's because it's always the same. The wording is very, very similar, if not identical. The bullet points will be identical. So let's just take a look at that right now really quickly. Write a unified, coherent essay about some topic and its implications. In your essay, be sure to clearly state your own perspective on the issue and analyze the relationship between your perspective and at least one other perspective. And then, you can see we have these three bullet points also. But these three are really just kind of good advice for any paper you might write. Be organized, use examples, write in standard English. This is the instructions right here in bullet point one. Say the topic is driverless cars, and you're given three perspectives. Two of the perspectives are in favor, one is opposed. Each of the perspectives that's in favor are in favor for different reasons. You are going to read those and then construct an argument based on at least one of those three perspectives. As you see here, your perspective can be in full agreement with any of those given, in partial agreement, or completely different. So you could just agree with the perspective and you would meet the requirements of this task. So here we're looking at a list of essay topics. There are 14 lessons aside from this one, actually there are 15 other lessons if you count the one that's in the strategy section. And they're done by Christen, Chris and me. You'll only hear Chris's voice in one of them, that's the Importance of Style down here. But all three of us kind of planned them cooperatively, so his ideas are reflected in all of these as well. And what's kind of convenient is that the most important lessons are these ones at the top. So these seven I think are the most important. if you wanna get even more specific I think the most important lessons are Planning your Essay and How to Wow the Graders and The Thesis. So my recommendation is to watch these first seven, and then start doing some practice. And then, as you're practicing, you can go back to these different lessons as you confront various challenges. But I don't want you to put off the practice too long. I don't want you to spend all your time watching lessons and not really get any effective practice in. How to Prep in 2-4 Hours. If you only have four hours to practice for this section or maybe even only two hours, what's the best way to proceed? Well ideally, you can devote at least four hours and if you can't, this is what I recommend. ou'll want to print out or you can download, but I do recommend printing a couple of different things here. So, this list you can see that it's linked below the video window with your instructions, your overall plan here. Example prompt, this is a prompt that's going to form the basis of most of the lessons in this series. So it's kinda nice to have a hard copy of that handy. Official score rubric that's put out by the ACT, so you can see well, what's the difference between the top score and the almost top score based on the different domain that you're being graded on. So there, you'll see in the lesson on scoring, there are four different main categories you'll be graded on, and you'll receive a score for each of those. And then also, there's a document that has two Magoosh practice prompts in addition to this example, so two other ones, and also a list of potential essay topics. Next I recommend that you watch the lessons sequentially after this one, all the way through the thesis lesson. And that'll take about 70 minutes. And after that, you start your practice. I want you to create three outlines, and each of those outlines should also have a thesis statement. On the actual test, we recommend 15 minutes to look at a prompt, come up with your outline and examples, and construct a thesis. And so, you might break this down into three different 15 minute practice periods or you could do three of these back to back. Just know that it's best to have the outline and thesis statements kind of paired up. After that, you can watch the rest of the lessons, I think, at 1.5 speed. Definitely slow down if something is new to you, seems really helpful, or you wanna pay attention more. And conversely, you might find that some of these early lessons, if you know the format pretty well already, you might not need to watch these slowly. You might be able to go quickly over the first ones. So it all depends on how much exposure you already have to the ACT essay. And then your last steps will be to study the official rubric. You can definitely do that earlier, but I want you to look it over before you write your first practice essay, a full practice essay. And so that would be using a new topic. So not using one of these three outlines, but a whole new topic from start to finish. And of course that's 40 minutes. See if you can find somebody who can provide feedback for you on the essay, and I would say go ahead and even give them a copy of the rubric. And then 15 minutes to review the feedback. And what if you only have two hours? Well, I think a lot of students don't even put in two hours, honestly. So, it's not going to be a full prep. Four hours, I think, is the bare minimum full prep you can do. But two hours is still probably going to be a lot more than many student do. You'll wanna print out the same documents and then watch these three lessons, planning the essay, how to wow the graders, thesis statement. Then watch these three on double speed, ex prompt, time management and scoring. Again, personalize this for your own usefulness. It might be that you really want to go slow on the scoring section, cuz you don't know that much about it, but you're awesome with thesis statements so you can go fast on that one. These are just guidelines. Read the official rubric, create 2 outlines and 2 thesis statements. And then, because we are in time saving mode, instead of doing a full essay from start to finish, you could just write your essay from one of these outlines that you've already written. If you do have more time available after you've gone through those steps, I think the best use of it is to practice writing body paragraphs and you can do this from your outlines. I think six minutes per body paragraph is great. So in closing, I urge you to do one of these tasks right now. If you are anywhere close to a printer, go ahead and print or download these four. If you're pretty sure you do want to print these out but you don't have access to a printer right now, go ahead and just watch the example essay prompt. The point here is that I want you to take action, because right now you're watching this lesson, you have some forward momentum, I want you to get to the next step. And then if you need to take a break, take a break and obviously if you have something very important to do I understand. But everybody else go ahead and just put in at least another five to ten minutes to take the next step towards your prep.